Eins, Zwei, Drei…: Fate/kaleid liner Prisma☆Illya 3rei!! Heyo, Day 4 of the Illya posts spam. Manga origin, still ongoing. Part 1 of the 3rei adaptation. Anime ran for a little longer this time, 12 eps. The storyline accelerated pretty damn quick this season. Massive plot twists as soon as the first ep already. Then, it never stops accelerating at that point. The story moved away from the fun, lighthearted mood from the previous 3 seasons, to the serious, deep tone. Pacing is slightly on the slow end, the intense battles are surprisingly minimal. Character development is probably one of the best, if compared to the other seasons. They never forget about tuning the comedy for the show, it feels great, sometimes a change of mood can be kind of nice. The climax is pretty decent, kind of wished for more intensity, judging from how great they have been doing for the 1st half of the season. Overall, as a Part 1 of the adaptation, its great, shouldn’t expect much since this season only covered the surface. They went from a 2 director team, back to a 3 director team again, not bad I guess, at least they are still maintaining the 2 scriptwriters. Animations by Silver Link, as usual. Combat scenes really great, it feels even more intense than Herz. Character designs were maintained, color feels a bit more vivid. It feels sharper too, since the previous 3 seasons were made only in 720p, they might have finally went 1080p. Music is great. They changed the composer from Kato Tatsuya to Technoboys Pulcraft Green-Fund. People are saying the soundtrack sounded weaker, to me, it feels decent. They made the ED and it’s probably the best ED out of all the seasons. OP is decent too, but I still like OP2 the best. Cast list remained, but with a bunch of new people. Hanae Natsuki, Morohoshi Sumire, Konishi Katsuyuki, Shiraishi Ryoko, Kugimiya Rie, Ise Mariya, Fukuen Misato. Pretty nice additions, nicely done. And also in the event of Matsuki Miyu’s sudden passing, Kakazu Yumi replaced her as Sapphire. She did a great job, even though her role is surprisingly minor in this season. Since you watched 3 seasons of it already, if you like it, just carry on with the 3rei, you will probably still love it. It has been confirmed that 3rei movie is coming to my place, but I’m not sure when, a review will come in due time. So you think the Illya spam is over??? NOT YET, WAHAHAHAHA, stay tuned tomorrow to find out. ← Welp, another season of the German 2? 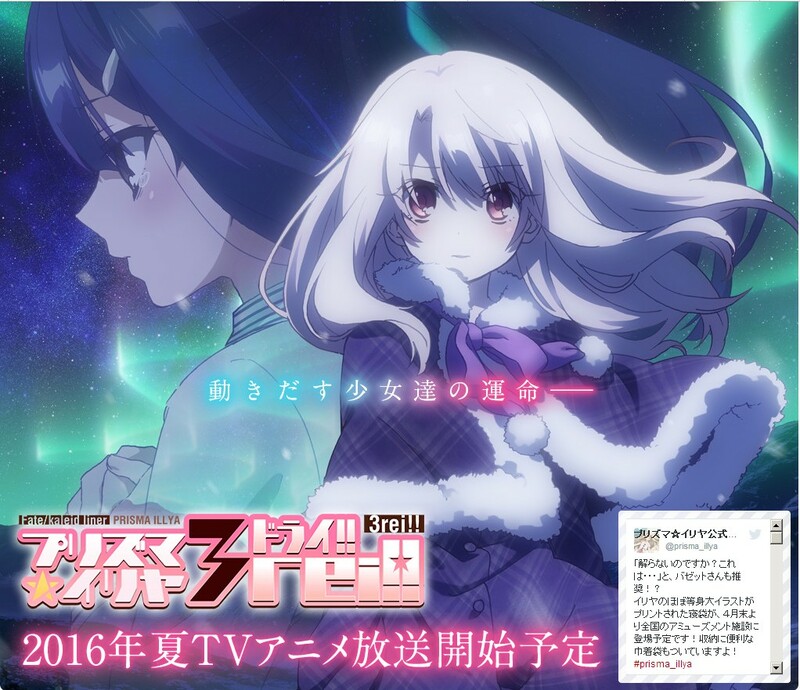 : Fate/kaleid liner Prisma☆Illya 2wei Herz! This one looks SOOO good compared to the third, which is the reason why I haven’t watched more Illya. To me, this spinoff’s heights are, ironically, in its higher-intensity fights and plot revelations. Good thing that this series seems to bring it all back into focus!